Nicki grew up in a small town in Michigan and now lives there with her family. She met her wonderful husband Tim, and they were blessed with 3 amazing daughters, Brooklyn, Madison and Hope. 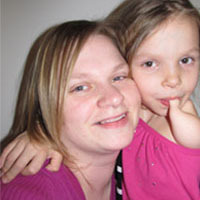 Nicki is a stay at home mom and enjoys every minute of her time spent with her family. She wrote this book to help her daughter get through a rough time with her peers at school. The response to this book has been overwhelming! Everyone that has read her story has urged her to publish so that this book would be available to help so many more children!